August 26, 2015 August 7, 2015 / Julie Brook, Esq. If you’re new to practice, you may have heard of retainer fees but aren’t sure how to get them and whether you can keep them. Here’s a look at the rules and a sample retainer provision to help you out. 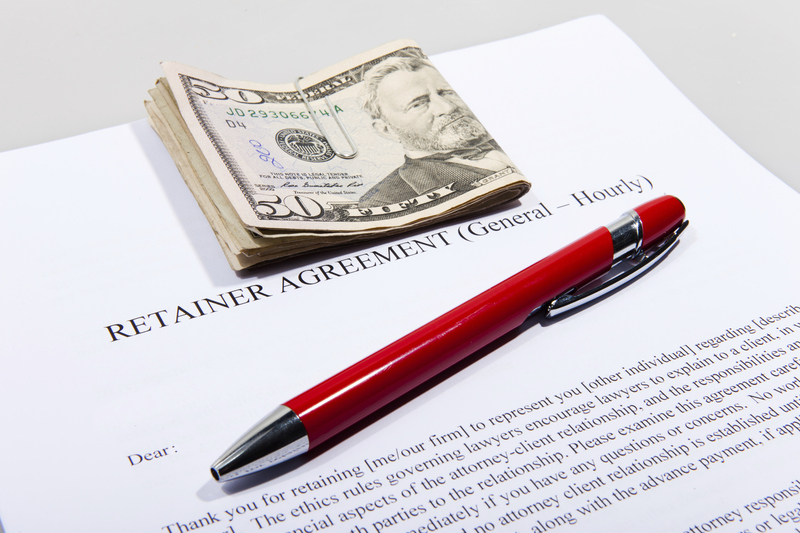 The key to understanding when you can keep a retainer is distinguishing between a true retainer fee of an attorney, which is paid solely to ensure the attorney’s availability for a specific matter, and a fee paid in advance to cover ongoing fees in a legal matter. A “true” or “classic” retainer secures the attorney’s availability and is earned when paid, regardless of whether the attorney actually performs any services for the client. See Baranowski v State Bar (1979) 24 C3d 153, 163 n4. See also Cal Rules of Prof Cond 3–700(D)(2). Because a true retainer belongs to the attorney when paid, there should be no requirement that it be placed in the client’s trust account. In fact, placing it in the trust account might raise the issue whether it is in fact a refundable deposit, not a true retainer. See Cal Rules of Prof Cond 4–100(A). Placing a true retainer in the trust account might also be considered commingling. By contrast, a fee advance for ongoing fees doesn’t belong to the attorney until it’s actually earned and should be placed in the client trust account. If you want to charge a nonrefundable retainer fee, you need to be sure that it meets the classification of a “true retainer fee which is paid solely for the purpose of ensuring the availability of the [Bar] member for the matter;” otherwise, it would violate Cal Rules of Prof Cond 3–700(D)(2). See Baranowski v State Bar (1979) 24 C3d 153, 164 n4. It may also violate the prohibition against charging, or collecting, an illegal or unconscionable fee. See Cal Rules of Prof Cond 4–200(A). So make the nature of the fee is absolutely clear in the fee agreement, and discuss the fee with the client so that there’s no misunderstanding about it. Client will pay to Attorney a retainer fee of _ _[dollar amount]_ _, to be received by Attorney on or before _ _[date]_ _. This retainer is paid to secure Attorney’s availability during the period from _ _[date]_ _ to _ _[date]_ _. The retainer is not refundable and is earned on the date when Attorney receives it, whether or not any services are performed during the retainer period. If Attorney performs services during the retainer period, Attorney will bill and Client will pay for these services under the terms set out in this agreement at _ _[insert reference to fee provision section or repeat fee provision here]_ _. Always include a time period for your availability. In re Lais (1998) 3 Cal St Bar Ct Rptr 907, 923, 1998 Cal Op Lexis 11 (true retainer agreement specifies particular period of time during which attorney will be available to client). Attorneys often attempt to protect themselves by including in their agreements provisions for “partially refundable” or “partially nonrefundable” deposits. Such provisions raise serious ethical issues and are likely to be treated by the courts as refundable deposits. If you’re new to practice or a veteran attorney going solo for the first time, check out CEB’s California Basic Practice Handbook, chap 1, where you’ll find more on the nuts and bolts of opening a law practice. For everything you need to know about fee agreements, including sample provisions and commentary, turn to CEB’s Fee Agreement Forms Manual, chap 1. ← Lost on a Motion in Limine? Make Your Record!